A mixed group of wolves and bears at the carcass. Biologist Tania Lewis with the National Park Service and Oregon State University graduate student Diana Raper placed a motion triggered camera on the carcass of a humpback whale that was found dead on the beach at Scidmore Cut in the West Arm of Glacier Bay in late May, 2010. Raper set up a motion-triggered camera and Tania Lewis, terrestrial biologist for the park, put a time-lapse camera on the whale. They photographed thousands of images before the carcass washed away Sept. 3. 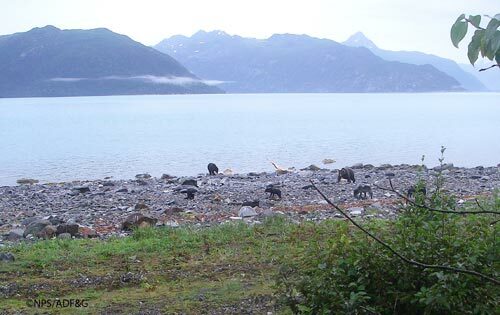 For more on this project, see the Alaska Wildlife News article: Scavengers On Camera.